Dale Earnhardt Jr. made his first appearance at a race track at Watkins Glen (N.Y.) International on Friday since being sidelined for concussion-like symptoms. Earnhardt has missed the last three NASCAR Sprint Cup Series races as Alex Bowman and then Jeff Gordon have filled-in as substitute drivers behind the wheel of the No. 88 Hendrick Motorsports Chevrolet. Gordon will drive the car Sunday in the Cheez-It 355 at Watkins Glen and again when the series returns to action Aug. 20 at Bristol Motor Speedway. The weekend between the two races is an off-weekend for the series. 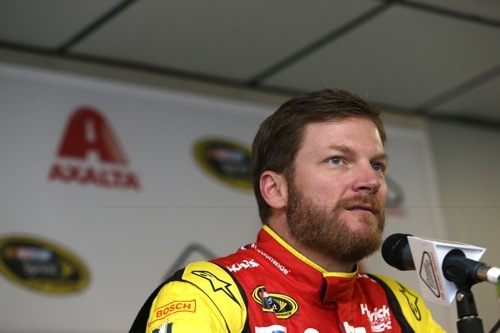 A date for Earnhardt’s return to racing has not been set. IS IT POSSIBLE YOUR DOCTORS WON’T BE ABLE TO GIVE YOU CLEAR DIRECTIVES SO THAT YOU WILL HAVE A BIG DECISION TO MAKE ON YOUR OWN FOR YOUR LONG TERM HEALTH? SINCE THIS PROCESS FIRST STARTED, HAVE YOU PERSONALLY CONSIDERED WHETHER YOU SHOULD CONSIDER RACING, OR HAVE THAT DISCUSSION BETWEEN YOU AND AMY, OR EVEN WITH JUST YOURSELF? CAN THEY NOT SET A TIMELINE UNTIL YOU ARE SYMPTOM FREE? IS IT YOUR EXPECTATION TO BE BACK IN THE CAR AS SOON AS YOU ARE SYMPTOM FREE? CAN YOU TALK ABOUT HOW FRUSTRATING THE ANXIETY-SIDE OF THIS HAS BEEN? ALSO, HOW HAS THE SUPPORT OF YOUR FANS HELPED YOU? “I’d love to speak on the support. It’s been awesome. All the NASCAR fans are supportive of all the drivers when they find themselves in situations that are challenging. It’s been no different. That’s helped me a lot and gave me a lot of motivation to get back and get back in the car. Even hearing from not only the fans, but also the other drivers and my peers is such a positive motivation. The more of that I see, the better. I think it helps me keep going and keep working hard and take my therapy seriously. As far as anxiety, with 2012 it was just about resting and not doing anything that would drive the symptoms and really letting your mind and your head rest to heal. For whatever reason, my doctor wants to push me into situations that drive the symptoms and that’s basically going somewhere that I’m not familiar with, or being in busy places. Going out to eat or going to lunch or coming here, my doctor calls that ‘exposure’. This is probably the worst situation (laughs) as far as making my symptoms go haywire, but that’s what he wants. He wants me to do anything whether it’s going places and pushing myself to get into areas that give me anxiety and drive the symptoms. All the rehab drives the symptoms. They want me to push the symptoms so my body gets used to them and they become suppressed and then it’s no longer an issue. “I kind of had the same thing with the old concussion. I could go places. The anxiety was bad and it would drive up the symptoms, too. That’s just part of the process. That’s a common occurrence with situations like this. You don’t want to go anywhere where you’re going to feel worse. And this situation, my doctor tells me, is good therapy to go somewhere that makes you feel worse. Go in there and get exposure and then get out and go somewhere where you can kind of get calmed back down and then repeat the process. And so, I’ve been going and eating and having lunch with my family. I go to Kelley’s house and get in the living room with her kids; boy that drives up the symptoms pretty good (laughter). But, it’s been great to spend time with them. It’s unusual, the time that I’ve been able to spend with them since we’re not racing. YOU’VE BEEN A BIG ADVOCATE FOR PEOPLE WITH CONCUSSIONS IN THE SPORTS WORLD. DO YOU HAVE ANY ADVICE FOR OTHER DRIVERS THAT MIGHT HAVE THE SAME SYMPTOMS BUT ARE AFRAID TO STAND UP TO IT? “It’s really hard, as a driver, to say that you’ve got a problem. And it’s hard to tell someone what to do in that situation. If you’re not feeling good; for me, I was sort of scared straight into getting checked out. When I got hurt in 2012, it was so severe and my body changed and my mind changed so much, I just had to get it looked at. I couldn’t go every day trying to self-manage my issues. And I just feel like, hopefully, anytime anybody gets dinged-up, or realized that they’re just not right, or they’re foggy, or whatever their symptoms are, that they would reach out to a neurologist and get checked out. And there’s easy access with our sport. We’ve got a lot of great people that are part of the sport and who have been part of the sport for a long time, that handle those issues and can get you to the right people. OUTSIDE OF NASCAR, HAVE ANY OTHER PROFESSIONAL ATHLETES REACHED OUT TO YOU TO TALK ABOUT CONCUSSIONS? DO YOU FEEL LIKE MAYBE YOU OPEN A DOOR FOR OTHER SPORTS TO MAYBE LOOK AT CONCUSSIONS MORE SERIOUSLY FOR OTHER ATHLETES? “I don’t know. I just know I’m trying to take care of myself. I’ve talked to a lot of drivers. I’ve talked to a lot of people. You get in this situation and a lot of people reach out and a lot of people have their own experiences that they want to share. And when you’re going through that, you definitely want to share your experience with people who have had a common experience. IS IT AMAZING TO YOU HOW FAR WE HAVE ADVANCED MEDICALLY? IN TALKING TO YOUR DOCTORS HAS IT ALWAYS BEEN WHEN YOU ARE HEALTHY AND SAFE TO GET BACK IN? OR HAVE THEY AT ANY POINT INTRODUCED AN ELEMENT OF IF? HOW LONG ARE YOU HERE FOR? WILL YOU GET INVOLVED WITH TALKING TO JEFF (GORDON) AND GREG IVES ABOUT THE RACE/COMPETITION? YOU’VE HAD A GREAT CAREER IF IT CAME TO THAT WOULD YOU CONSIDER? HAVE YOU THOUGHT ABOUT IT FROM THAT PERSPECTIVE? “When I went to see Dr. Petty for the first time in 2012 and then he set me up with the guys in Pittsburgh (Pennsylvania) they told me that our process was to get better and go back to racing. This one is no different. When I first went to see my doctor in this particular instance it was I need to get right because I need to get back in the car as soon as I can. I’m surprised that I’ve missed this many races. I never thought this would take this long. I didn’t have a massive accident and I didn’t have really crazy symptoms. This thing happened so awkward where we had the accident in Michigan and then the symptoms crept in very slowly like two weeks later. I didn’t think this was that serious, but it had gotten to a point to where I definitely didn’t need to be in the racecar. At that point you’ve got to go get checked out and get ahold of it and figure out how to fix it. But, from the very onset of this it was ‘man this will go away in a couple of weeks. I’m going to have to miss a race or two and we will get back in the car and we will get going again.’ I’m thinking about, well it’s going to put more pressure on me to win a race to get in the Chase and all that stuff. I have every intention of honoring my current contract.